It was a dark and stormy morning as the usual and unusual suspects gathered at Rancho Veloce, in the Napa hills. Coffee made a welcome hand-warmer at the barn, as most of us were too excited about seeing old friends to hike up the house to get out of the cold. I’d ridden up from Vallejo on my Buell with Jeff on his newly incarnated Venom and our friend Fred Mork on the Endurance. Although Mork has sponsored Jeff in many Trials events, this is the first time Jeff has been in the position to return the favor. The route was back to the circle we’d done a couple of years ago. 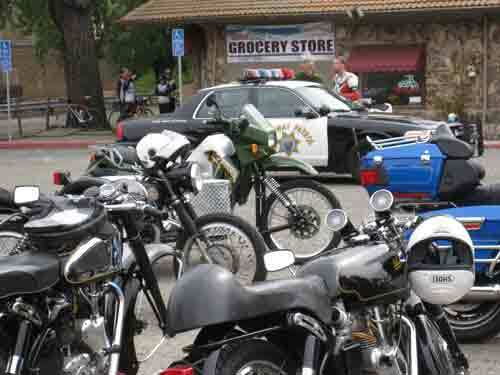 From the Rancho Veloce we rode up the curvy 128 to Moskowitz Corners where there is a café that is sometimes open. As we rode up 128, Jeff decided to test his bike and he disappeared around a corner. Mork is used to road racing and those crazy club rides (of another marque) where everyone stays together. He wasn’t accustomed to the casual manner of a Velo ride in which everyone gets their own copy of a map and are free to follow it or not, at whatever pace they want. However once Jeff had disappeared I put myself in the lead role to make sure Mork didn’t fly past the next turning. In the parking lot outside the café at Moskowitz Corners, we had the first “incident.” Fred Meyer had a flat. He’d picked up a screw in his front tire. Meyer takes a screw for the team. Note the collection of tools on one red rag. The other is used to protect the bricks. Meyer had some tools, but others had to be borrowed. No begging or twisting of arms was needed. As Meyer collected bricks to raise the bike, tools and parts just appeared, as if from tool fairies and parts elves. Tire irons, screwdrivers, an inner tube and even air all appeared just when they were needed most. Mork jumped in to help with his expertise and elbow grease. Mork pulls the screw out of the tire. By the time the people inside the café had gotten their food, Meyer was ready to get back on the road. Or so it appeared. 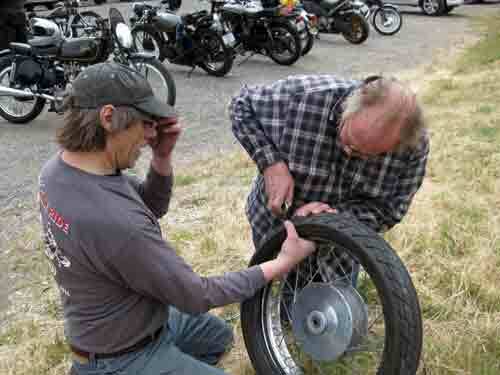 Velocette rides are made up of incidents like this. Any motorcyclist may find him or herself in need of repair on the side of the road. 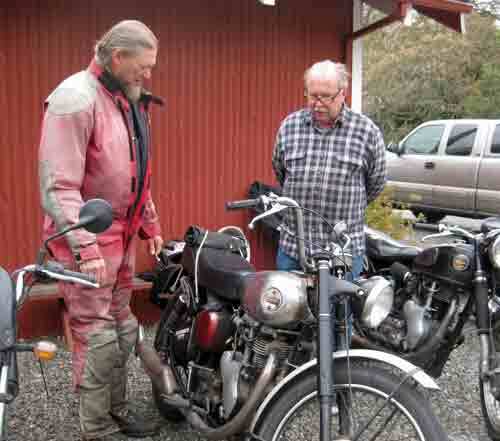 The older bikes may be especially disposed to parts failures. However people share experience and parts and manage to keep the bike going. While the tire repair was in progress, a CHP car rolled into the parking lot. I didn’t see anyone making sure their license plate was screwed on tightly, a few people referred to past tickets and grumbled their discontent. However the officer had stopped for a humanitarian reason; he’d found a wallet by the side of the road and it contained the registration for a 1975 Norton. He stopped to see if the wallet belonged to anyone we knew (it didn’t). People who love the road help each other. The rest of the ride was gloriously uneventful. We rode past Lake Berryessa, west to Pope and then south through park lands to the Silverado Trail, then up the Oakville grade and back to Rancho Veloce. There were no mechanical failures, no more flat tires, no wrong turns. In addition there was little traffic on the road and the weather, while a little chilly, was mild. Overall this was a great success. Meanwhile back at Moskowitz Corners, Meyer attempted to start his bike. No spark. Fortunately some Velocette riders including late arrivals were there to help him get moving. Back at the Rancho Veloce, John and Sue Ray put on a lavish spread of appetizers including vegetables from Sue’s garden, and lots of drinks. 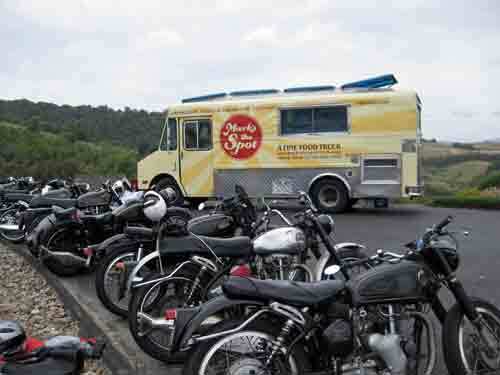 Then the “taco truck” arrived with the main meal. “Mark’s the Spot” served gourmet sliders, hot dogs, salads and desert. 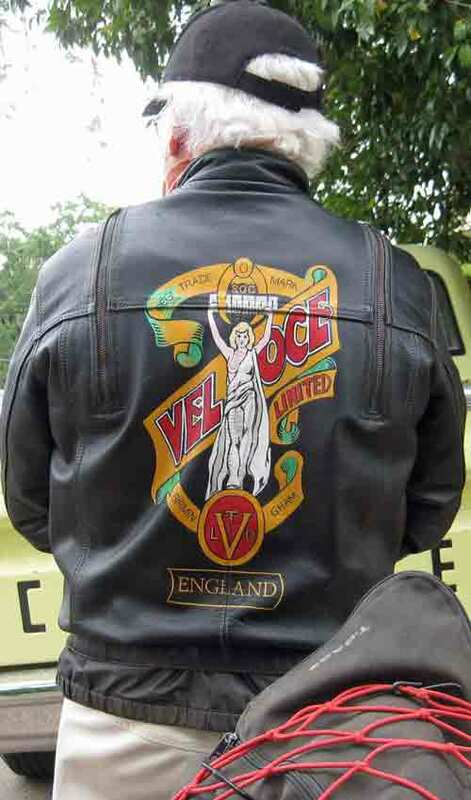 This entry was posted in Velocette & other British Motorcycles and tagged Fred Mork, Lanora Cox, Velocette. Bookmark the permalink.